N/At of software products for CFD (Computational Fluid Dynamics) and the 64-bit Itanium(tm) processor have been designed to address the demanding needs of researchers and engineers in many industries such as automotive, aerospace, energy, chemical, rotating machinery, ventilation, and process. The Itanium processor incorporates many leading-edge features specifically designed to address the expanding needs of the workstation user such as highest floating-point performance and large memory capabilities. 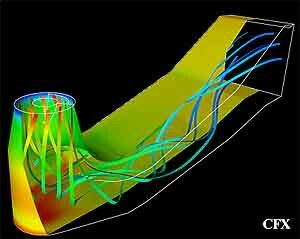 CFX is powerful fluid engineering software that simulates industrial flow and heat transfer processes. The suite is specifically developed to address the needs of both specialists and generalists in the mechanical and chemical industries by combining advanced core technology with object-oriented methods. Results and inputs are made available in accessible formats that are easily exchanged throughout the organization. Collaboration with industrial partners and consortia ensures that the rapidly changing needs and wants of our customers are reflected in the CFX products and services. , 554 Parkside Dr., Waterloo, Ontario, Canada N2L 5Z4. Tel: 519-886-8435; Fax: 519-886-7580.